“Eli Ever and Victor Vale were only medical students when their mutual discovery that near-death experiences can, under the right conditions, manifest extraordinary abilities. If there can be life after death—will there be calm after vengeance, or will chaos rule?” (Goodreads). It really shouldn’t have taken me so long to get to this review honestly, considering I loved this book so much. I actually cried when it ended, partially because “what on earth had just happened” and partially because “wow, I hate goodbyes.” If you’ve read it, you’d understand both perspectives, I think. 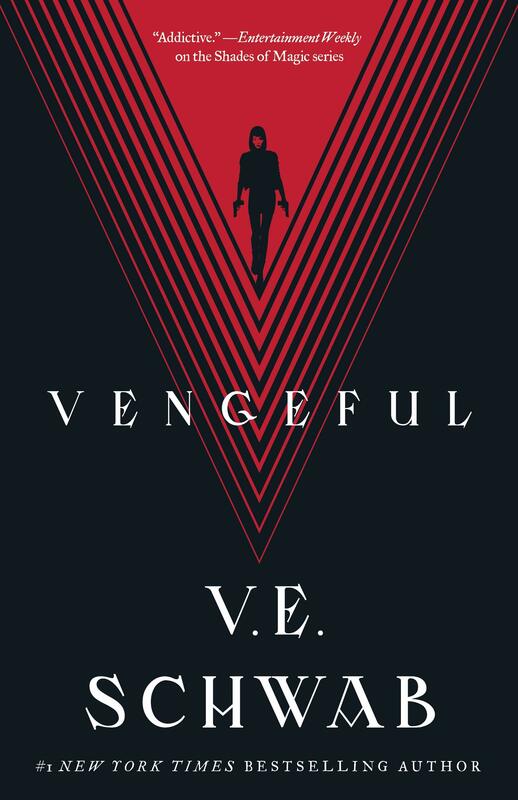 Anyway, I think one of the most important things to acknowledge is how different Vengeful is from Vicious. It ended up working for me on two accounts: the dark aspects and the pacing. Both books are incredibly dark, but in different ways. Vicious dealt more with the intentional transformation to an EO, meaning that both Victor and Eli basically committed suicide to put themselves in that state. However, Vengeful was darker in the murderous, violent aspects, which mentally, was better for me. Vicious was difficult for me to read because of the “suicide” (not with intent to die) aspects and in that sense, Vengeful was much easier to swallow. As for pacing, both books jump in time, but where Vicious is more methodical and slow, Vengeful jumps into action immediately and stays there. For some, this was disappointing, and while I do agree that there is a disconnect between the writing of both (especially considering how long was spent between the publication of both), I found this pacing to work more effectively for me. I’m a fast-paced kind of girl. So for me, Vengeful excelled where Vicious did not and that’s what made it a fantastic sequel. Although, I am in the unpopular opinion realm with this. I could go on for hours about how effective Schwab’s writing is, how she drills her points in so easily, how effortless the writing reads (despite knowing how much effort is put in on her behalf), how descriptive yet smooth it is. She is one of the most skilled writers I have had the pleasure of reading. Not to mention, she masterfully writes two brilliant antiheroes, Eli and Victor, both of whom I simultaneously hate and love. Victor. Victor was easy to love in Vicious. He was angry, yet determined. He was searching for something. And he formed the most…tender found family I have possibly read about. However, he has sharp-edges (and I do love sharp edges). In Vengeful, he transforms. He’s angrier, seeking vengeance (ha), less reliant upon his family, more strict with Sydney. I adore Sydney and I adore him, but their relationship seemed so flawed here (and not in a bad way); Schwab really highlighted the tensions of their growing pains well. I both understand his actions in the ending and don’t. In a nutshell, he was harder to love in Vengeful, but he was also more human in Vengeful, if possible as an EO. Eli. I found it easier to hate Eli, but I realize the flaw in my own mind here. Victor’s backstory was on page, but Eli’s was not during Vicious, and I mistook what I had seen of Eli as all there was to see of him. When Schwab introduced Eli’s backstory in Vengeful, my heart broke. I adopted Eli into my group of sad and damaged, misfit, fictional characters that I want to hug (even if they’d stab me for coming within ten feet of them). Eli isn’t pure evil and Victor really isn’t either; both of them have been damaged so much that their actions are warped as a result. What did I want then? Who did I want to win? My idealistic brain wanted a truce, some way for them to be happy forever, but completely distant from each other. Victor could go live with Mitch and Sydney and Eli could go live…elsewhere. But they’d both be alive! And healing! Before I get into spoilers and how exactly Schwab destroyed every ounce of my soul, I should get into the new editions: Marcella and June. Marcella and June were not easy to like. Marcella was interesting, yes, but too revenge-seeking for my taste. With that said, however, I was fascinated by her, and found her parts just as enticing as the others. June, on the other hand, creeped me out. I couldn’t help but feel that she was preying on Sydney. Just…no… But nevertheless, I found her someone rather interesting to read about as well. Schwab writes some pretty darn good characters. Okay. The ending was…weird. I had to read it twice over because I didn’t believe what I had read. Victor surely told Sydney where they would meet again, right? They would live happily ever with Mitch and the dog and hot chocolate, right? Was he going to die? Certainly not!!! I’m half dissatisfied and half stunned at the cleverness. Yes, the ending is tragic, but it’s also…well, it’s Victor, isn’t it? No, he doesn’t die, but yes, he does walk out and leave his lovely found family. I was so angry with him and I still am, but I guess it does make sense. Does Victor believe himself worthy of happiness? Does he believe himself necessary to their lives? He’s a loner through and through. And I do believe that there’s more coming (especially since Schwab posted this morning on IG that there will be one more!!!). But anyway, it was angsty. And it was sad. And I cried because I didn’t want to see them say goodbye and I also didn’t want to say goodbye myself. Anyway, if you haven’t tried this duology-series-whatever it is, I highly recommend doing it. But if you’re not in the right headspace for Vicious, your mental health should come first and foremost. It’s not an easy book to read.